In 1979, using ceramic tile, Eduardo Carrillo (1937-1997) created a remarkable mural, forty-four feet long, as a commission for the city of Los Angeles. Born in Santa Monica, Carrillo studied at UCLA with Stanton MacDonald Wright and William Brice, and also spent a year in Spain, where he came to admire the paintings by Hieronymus Bosch, Diego Velazquez, and El Greco in the Prado, as well as the work of Giorgio de Chirico. As he matured, he combined the Spanish and Mexican Baroque traditions with European modernism, achieving work of highly personal authenticity. In 1966 he founded El Centro de Arte Regional in La Paz, Baja California, which he directed for several years. There he helped revive the regional crafts of ceramics, leatherwork, dyeing, and weaving for the production of fine salable items. In 1972 Carrillo joined the art faculty of the University of California, Santa Cruz, where he remained until his death in 1997. In 1976, as a gift to the community, he painted a mural based on the theme of birth, death and regeneration, in a vaulted passageway near a downtown shopping mall in Santa Cruz. The mural was obliterated, however, by a bank that later acquired the property, the manager claiming he had no idea of the value of the work. Carrillo’s ceramic mural for Los Angeles was done on a curved wall in front of the Church of Dolores, close to Siqueiros’s mural Tropical America on Olvera Street, in the original Mexican section of the city. Entitled El Grito, it commemorates the Mexican revolt against Spain in 1810. Father Miguel Hildalgo y Costillo, Mexican Creole priest, launched the revolt with his cry for independence, known as El Grito de Dolores. Leading an insurgent army in the early fight for independence, Hildalgo is said to have carried the banner of the Virgin of Guadalajara, but was eventually defeated by royalists. Hidalgo was defrocked and shot. But his grito, calling for the freeing of slaves and the redistribution of land was not forgotten. In Carrillo’s mural Hidalgo is the central figure. Next to him we see a woman carrying the standard of the Virgin of Guadalupe, and farther to the right Native men with arrows, women carrying baskets of corn, and children at play. Spanish grandees flee on horseback, and a black flag displays a skull and crossbones. The luminous glazes of the ceramics, predominantly in blue and ochre, endow the work with an amazing glow. Carrillo’s later paintings, shown in a solo exhibition at the Crocker Art Museum in Sacramento in 1986, were often preoccupied with images from Mexican mythology, history, and contemporary culture. Painted in closely hued vibrant colors, these depictions of human drama convey a sense of mystery, reminding the viewer of Surrealist imagination. – Ramses Noriega, Saul Solache, and Sergio Hernandez- in the Chicano library at the University of California, Los Angeles. He later painted another mural in a Sacramento barrio. Now he is more introspective about these things. His recent works reflecting nonpolitical points of view are more related to artistic problems. He is concerned with the appearance of objects, their surface configurations, and their identifying textural qualities. Carrillo, born in Santa Monica, California, in 1937, attended Catholic grammar and high schools in Los Angeles. He entered Los Angeles City College in 1955 and transferred the following year to University of California, Los Angeles where he studied until 1959. He received a Departmental Award at City College and the Art Council Undergraduate Award at the University of California. From 1960 to 1961 he studied drawing at the Circulo de Bellas Artes in Madrid, Spain. In 1961, he returned to the University of California, Los Angeles, where he received the Bachelor of Arts degree in 1962 and the Masters of Arts degree in 1964. During his last year in school Carrillo was a teaching assistant. He later taught art at the University of California Extension in San Diego from 1964-1966. He left the country again in that year and went to La Paz, Baja California, where he founded and directed the Centro de Arte Regional until 1969. He and his wife taught ceramics, weaving, and dressmaking to local teenagers. He returned to the States in 1969 to work as an art instructor at San Fernando State College. Since September of 1970 he has taught at Sacramento State College. 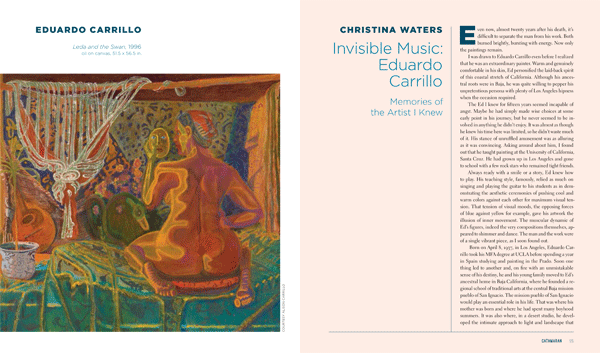 Carrillo has exhibited widely since 1962 at the Ceeje Gallery and other places in Los Angeles, and other southern California cities. Since 1966 he has exhibited in Hayward and Sacramento, California. Outside of California he was included in a group exhibition, “Painters of the Southwest,” held in Houston in 1963, and in a juried show in the Palace of Fine Arts, Mexico City, in 1968. His most recent one-man show was held at University of California at Santa Cruz in October 1971.
now in the Prado Museum. Carrillo’s paintings are comprised of imaginary landscapes and figures. Carrillo’s meticulously painted landscapes of the early sixties-oils on wood panels- are comprised of vast open areas in which are found lakes or seas, architectural and, on occasion, animal forms. These imaginary landscapes are broken down into various spatial fields, with the frontal plane invariably sharply delineated by man- made walls, staircases, and towers, serving as a proscenium, to which objects and terrain within the middle and back planes are related. His Subterranean Garden has a thin double walled precinct in the foreground in which are placed a number of unusual geometric structures. In the center is a conical structure with smoke coming out the top and a rectangular one with notches. On the left side is a partially empty rectangular depression (pool?) with a staircase at one end. Within the double walls are evenly placed trees whose foliage can barely be seen rising slightly above the walls. The foreshortening of the walled precinct, based on a single vanishing point located slightly above the opening in the center, demonstrates the elevated position of the viewer. The tilted middleground is comprised of rolling hills, abutments, roads, and evenly distributed trees (six on each side). There is no variation in the spatial intervals between them. Another walled precinct, found a little beyond this middleground and foreshortened according to another eye level, creates the effect of a ground again falling away into the distance. The orthogonals of the two precincts break the visual surface along diagonals in contrast to the series of planes found in the middleground and the background- the water, hills and trees. Carrillo’s Cabin in the Sky is evocative of the same type of feelings. But, now, the placement of totally unrelated objects within a similar spatial arrangement- the large shell in the middleground and the profile representation of the large rabbit to the right of it-gives this work an even more unusual aspect. This is further enhanced by the celestial cabin amid a turbulent sky. The usual grounds-front, middle and back are now relegated to the lower half of the painting, with the sky taking a much larger portion of the visual surface. The extreme foreshortening of the temple, which gives a strangely anchored effect, in the gravitational sense, contrasts sharply with the predominantly horizontal directions, or planes, of the terrestrial sphere. imagination and the needs of the painting. The middleground gives way almost immediately to a great expanse of the extreme background. The representation of objects within the landscape in all three paintings demonstrates the use of various eye levels within each. Yet, even with these similarities, the definition of the horizontal in each is dictated by the needs of the theme. In Subterranean Garden the sky is a mere sliver, while in Cabin in the Sky it takes up half the visual surface. In Fortress at Turrey Pines the sky takes up one-third of the painting. Carrillo’s most recent works are equally meticulous in their representation of objects. However, the vast expanses of the imaginary landscapes now give way to close-up views of specific locations, like the exteriors and the interiors of a home- the front and back yards, a kitchen floor, chairs, tabletops. A good example is Testamento de el Spiritu Santo. The same spatial habits are retained but more circumscribed to the frontal plane, in which the numerous objects are placed. This is also the case with his House in Venice and Backyard. Both present a vertical plane of the house-the front and the back- on the left as a limit to the foreshortened extension of the foreground. A narrow section on the right allows the artist to open up the tightly enclosed cubical space of the foreground. This device is also used to show other homes and automobiles on the periphery. There is a strict adherence to horizontals and verticals in House in Venice, which is partially retained in Backyard. The tunnellike effect of the carport in which the Volkswagen bus is parked is de-emphasized by the inclusion of the gate and the fence leading to the backyard. Although Carrillo studiously restricts his selection of subjects to these almost snapshot types of views of his immediate surroundings, he takes these and presents them in a tightly knit compositions that are spatially based on a series of planes that constantly echo the frame, along vertical and horizontal directions. The habit of relating a foreshortened ground plane to a vertical wall plane, with an opening to the right of the visual surface, is also found in his painting of a chair placed in front of a large chest. The painting entitled Fisheye is a faithful representation of a tiled floor on which are placed three plates, with the center one turned over. The octagonal-shaped tiles and the lines placed perpendicularly to each of the four sides of the tiles that are parallel to the frame are used in a subtle way to define the tilted plane of the floor. The octagonal shapes are foreshortened, as are the vertical lines that represent the orthogonals of the linear perspective used. The overall pattern is beautifully contrasted by the inclusion of the three plates along a diagonal starting on the upper left and extending beyond the lower right. Carrillo has a keen sense of space- the substantive part, I believe, of his paintings. It is the arrangement of the numerous objects within the controlled spatial frameworks that is evocative of the dreamlike scenes in which human beings are rarely included but whose presence is indicated by the objects. This is as true of his earlier imaginary landscapes as it is of his more recent blown-up details of his immediate surroundings, within the home and its exterior.